U-Bahn Beton® is a modular framework in recycled polypropylene that was specifically designed to create one way slabs that are cast on site or semi-prefabricated. The various modules, which overlap on the edges, make it possible to create beams of any length. Thanks to its conic elevator feet, immersing the U-Bahn Beton® formworks in the concrete casting will obtain thick, parallel beams that are closed from the bottom and top by a flat plate made in sequence with a single casting; this results in reduced use of concrete and steel as well as considerable advantages in terms of fire risk in comparison to formworks in expanded polystyrene. Light and stackable, it is easy to handle during positioning, functional in its use, can be exposed to bad weather and is easy to store in the yard with minimum dimensions.Designed according to strict quality criteria, the U-Bahn Beton® framework is guaranteed to resist without concrete 150 kg concentrated on a load imprint of 8 x 8 cm, as foreseen by current regulations. Unlike with the use of classical hollow brick blocks, the empty space left by U-Bahn Beton® can be used for the passage of cables and systems. Reduction in time and cost related to positioning the formworks. High precision and regularity of the width of the concrete slab ribbing. Flexible, practical and simple creation of lengths below the standard size. Greater yard cleanliness and improved disposal of the waste in comparison to traditional formworks (hollow blocks and EPS). Better work performance guarantee in comparison to expanded polystyrene that, due to its crumbling into granules, tends to attach itself statically to everything, and is difficult to remove, compromising the correct filling of the concrete for the beams and in the nodes. Possibility to trim the soffit with immediate economic advantages, avoiding expensive plastering. Possibility to perform a single concrete casting for the creation of lightened slabs with the slab also in the soffit. In comparison to traditional formworks (hollow blocks and EPS), the layer making up the soffit must first be cast, then the formworks and the reinforcements are positioned, and then concrete is again cast. Quicker execution of prefabricated slabs without the need to prepare specific safety vents in the case of a fire. Providing the slab with greater fire resistance. 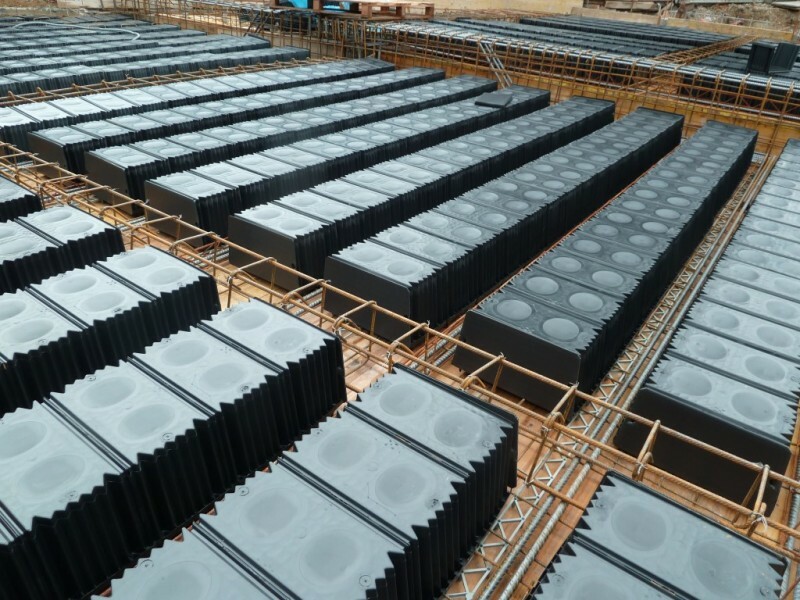 Considerable reduction in the yard of overall volumes as well as the overhead handling of traditional formworks (hollow blocks and EPS) thanks to its characteristics of stackability, modularity, lightness and manoeuvrability. Better seismic behaviour; the presence of a dual reinforced concrete layer, which makes it possible to more solidly connect the vertical structures of a building in comparison to a traditional slab. Advantage of using the cavities created using U-Bahn Beton®, which run along the entire slab, as an equipment room for various types of systems. U-Bahn Beton® is the ideal solution for creating lightened one way slabs for all types of structures:residential, commercial, executive, industrial buildings as well as public structures (schools, hospitals, etc). U-Bahn Beton® is fundamentally used in all applications that require one way beams and slabs as well as a reduced use of concrete and reduced weight. With U-Bahn Beton® slabs with a greater thickness can be created with less concrete. A particular type of use of U-Bahn Beton® is for constructions carried out using the ‘top-down’ technique (by compartments or layers) where instead of working from the bottom upward, work is performed from the top downward; first the slab is created and then the excavation is made. Underground parking buildingsin historical city centres are often created using this technique due to the obvious constraints related to the presence of numerous buildings as well as the need to quickly restore traffic flows. For projects that use this technique, it is of strategic importance to supply the yard with light-weight and non-bulky material. 1. 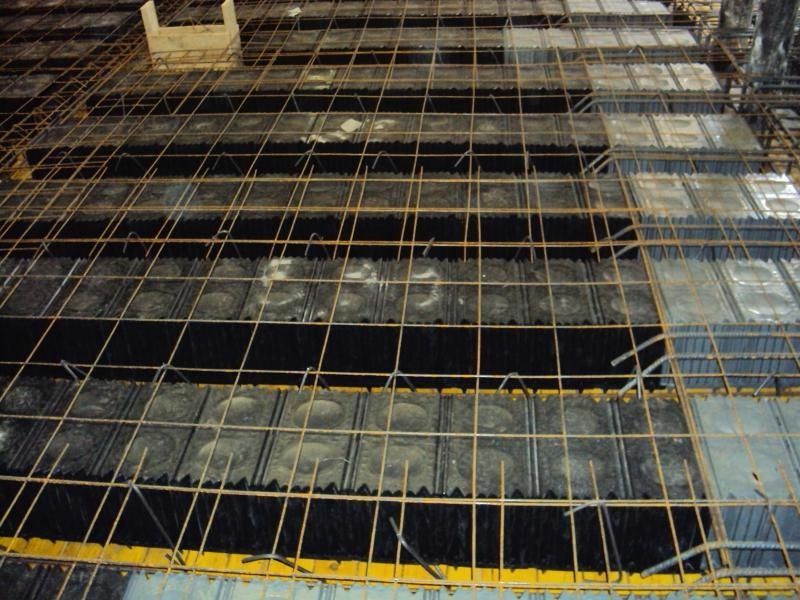 The entire surface of the slab to be cast on site is shuttered with wood deck (or similar systems), then the welded reinforcement irons and mesh are positioned according to the design and the spacing lattice for the upper reinforcement is arranged. 2. The U-Bahn Beton® formworks are positioned with the desired centre distance that will determine the width of the beams. Thanks to the conic elevator foot, the U-Bahn Beton® formworks will be lifted from the surface, making it possible for the lower slab to be formed. The systems will be arranged in the internal cavities of the formworks. 3. The positioning is completed by closing the open final ends of the U-Bahn Beton® formwork with a lateral closing plug above which the reinforcements, welded mesh as well as the instruments for cutting and punching are positioned according to the design. 4. The concrete casting must be performed in two phases to prevent the floatation of the formworks: an initial layer will be cast to form a thickness equal to the height of the elevator foot. Casting will continue for this first portion of the slab until the concrete starts to set and become less fluid. 5. Once suitably set, the casting can be restarted from the starting point, completely burying the U-Bahn Beton®. The casting is then levelled and smoothed in a traditional manner. 6 Once the structure has hardened, the formwork can be removed. The surface is smooth in correspondence of the soffit. System certification pursuant to ISO 9001 – ISO 14001 – SA Standard 8000. Daliform Group has again demonstrated to be extremely precise with regard to respecting health and the environment having been the first to obtain Environmental Compatibility Certification (CCA) for its products. This certificate is very important for U-Bahn Beton® because it demonstrates: the lack of dangerous substances in its composition (even if recycled materials are used); the lack of emissivity of toxic substances during the various phases of the product’s life and operating cycle, which benefits the health of the intermediate users (production and installation personnel) as well as final users (people living in the building) as well as the environment in general.